When two teams play each other twice in quick succession, the second game is often boring and predictable – so the fact that there were eleven changes between the sides from the weekend’s line-ups was a welcome surprise. That first game was a league game, where the sides drew 2-2. The first leg of this encounter was, ludicrously, as longago as 3rd February, where a Diego Milito goal gave Inter a 1-0 win. Away goals counted after 90 minutes, so a single Inter goal would leave Fiorentina needing three. 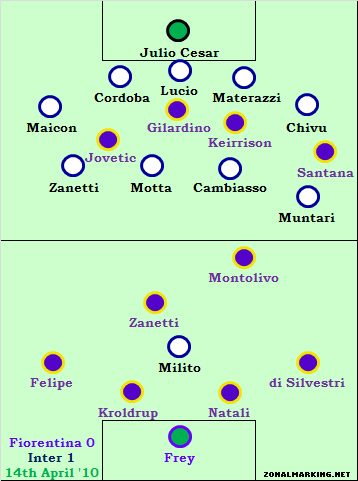 Fiorentina essentially returned to their strongest available line-up - Alberto Gilardino upfront, Juan Vargas and Marco Marchionni back on the flanks, and Cristiano Zanetti in the holding role, in their usual 4-2-3-1 / 4-1-4-1ish system. Mourinho chose to deploy Maicon in a wide-right position (interesting, considering his Brazilian right-back rival Dani Alves played the same position in El Clasico last weekend) in a three-man attack, with Samuel Eto’o and Mario Balotelli switching between the central striking position and the wide-left position. Javier Zanetti sat in front of the four-man defence, which included Ivan Cordoba at right-back, with two midfield battlers in front of him. The main feature of the weekend’s game was that both of Inter’s goals came from right-wing crosses played in behind the Fiorentina defence, and Maicon exploited Fiorentina’s weakness there from the outset. Twice he got into dangerous positions, with Felipe looking no more comfortable at left-back tonight than he did at the weekend. It was a strange tussle in that area of the pitch – a right-back at right-wing against a centre-back at left-back, and Maicon clearly had the beating of Felipe for pace. He also played much deeper than Balotelli on the opposite side, and often found himself in space when Vargas ventured forward. The fact that Inter’s left-sided centre-back was left-footed helped, as Materazzi looked to hit long left-right balls into Maicon’s path. At the weekend, Fiorentina took up a 4-5-1 shape with Jovetic becoming the left-winger in the defensive phase of play, and they started by playing this system again. But the system was fairly pointless because Maicon was not at right-back, and his replacement, Ivan Cordoba, never looked to get forward. Therefore there was no need for Jovetic to be tracking Inter’s right-back, and Cesare Prandelli instead told him to play a more central role, and pick up Javier Zanetti when Inter had the ball. This led to Fiorentina dominating possession for most of the first half, and they created numerous half-chances. The freest midfielder on the pitch was Cristiano Zanetti, and he played a couple of superb balls for Gilardino, who was unfortunate not to score. It was slightly surprising that Sulley Muntari was not pushed forward onto Zanetti, although Mourinho clearly wanted a ’spare’ player in the defensive midfield zone. Fiorentina were rampant towards the end of the first half, but failed to take their chances. Often they simply had two few players inside the penalty area when balls came in, whilst they probably could have done with a more attacking force from left-back to allow Vargas to take up a more central position. No changes at half-time, and the tie was effectively won after half-time when Eto’o found himself in a crazy amount of space inside the area and lashed in. Fiorentina’s offside trap failed miserably, and they have conceded too many goals recently by simple balls played into the space between defence and goalkeeper. Knowing that Fiorentina needed three, Prandelli brought on another striker – Keirrison, and lined up in a vague 4-4-2 / 4-3-3 shape with Jovetic playing to the left of the two forwards. Mourinho immediately responded – taking off both Eto’o and Balotelli, and bringing on Diego Milito (to hold the ball up) and Esteban Cambiasso (to add extra steel to the midfield). Inter then pushed Maicon to right-back, shifted Cordoba in one, and lined up with a remarkably defensive 5-4-1 system (with four defensive midfielders) that shut down the game extremely well. In fact, whilst Fiorentina had much of the ball, Inter looked equally likely to score on the break. Little happened for the half hour Inter played with the 4-5-1 shape. They were happy to defend, whilst Prandelli later admitted that the Eto’o goal effectively won the tie, and Fiorentina looked demoralized. Inter will be happy to progress to the final, but will be disappointed at the nature of the two results in Florence – they drew when they needed to win in the league, and then won when they merely needed a draw in the cup. For Fiorentina, a potentially glorious season comes to a trophyless end, and they are now battling to scrape into the Europa League next season. With Sebastian Frey, Stevan Jovetic and Juan Vargas wanted by some of Europe’s elite, qualification for the Europa league might be the difference between the end of an era, and another season with some of the most talented players the club has played in years. This game neatly summed up Fiorentina’s failings this season – they’ve dominated so many games but failed to take the points. For supporters who have always been more concerned than the rest of Italian football about pretty football, it has been an enjoyable season and the majority want Prandelli to stay for next season – but they really would have loved a trophy. It may be the case that Mourinho wanted to try something ultra defensive, with the tie won, in respect of the games against Barca. Good write up. I wonder if that second half is what we’ll see in Barcelona in the second leg? If Inter get a 1-0 victory next week in Milan, I wouldn’t be surprised one bit if that’s what he played. The weak links for me, however, are Muntari and Motta. Mourinho’s preparation for Barça has clearly started. Javier Zanetti is one of my most favourite players in all the years I have watched football. His balance and ability to dribble out of tight spots is quite remarkable. But his adaptability while prolonging his career and making him a favourite of coaches hasn’t always served either him or his team. Primarily a right sided Defensive Midfielder, Zanetti is good as a DM at closing down space. For years he has played RB or LB at Inter where his ability at one-on-ones and lack of speed have shown up. Zanetti at LB would be suicidal for Inter against the options of both Messi and Alves. Even Pedro might be encouraged to take him on. Shifting him into right midfield (from where he can also cover for Maicon) is the first safegaurd for Mourinho. I fancy Cambiasso and Motta/Stankovic to line up beside him in midfield. Mourinho will doubtless be contemplating using Balotelli given how effective Walcott was against the Barça defence. Sneijder will play in front of the midfield. Eto’o has to start since he is so effective in these big games and against his former clubs (especially the ones with which he has an axe to grind). So the choice lies between Balotelli and Milito. Well, to tie all that to this article, I think Mourinho was experimenting to see how the Balotelli-Eto’o combine would work up front. Knowing Mourinho’s penchant for mind games, too, it might also be the case that this is a bluff to throw Barca’s scouts off. Although I’m not too sure Barca alter their gameplan for anyone. Either way, it makes the tie intriguing. It actually sounds like the tactically inferior side won (didn’t see the game). 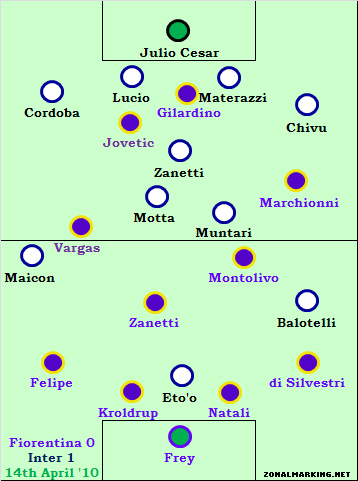 Based on the article Inter was fortunate to go ahead largely due to poor defense from Fiorentina. Also lucky that they didn’t concede. It seems strange that Mourinho wouldn’t change tactics to do something about Zanetti given his track record good tactical decisions. The Goal of course changed everything, but it almost seems like Mourinho was just hoping for the best and not really trying to beat Fiorentina tactically. Could be wrong here but sounds like Inter’s tactics didn’t really win the game, and could have lost it if Fiorentina hadn’t been wasteful. Well, Inter won and Fiorentina lost, so that would mean that Inter’s tactics won the game. In football, tactics are designed to win a game. If you lose, then your tactics didn’t work. If you win, then your tactics worked. The key point that most fans miss is the relationship between possession and control. A team with most possession is often seen to be the team in control, and the tactically “better” team. However, that is different from controlling the game. There are two ways to control the game – by scoring more goals with your possession, or by denying goal-scoring chances with your defense. If you allow the opposition to possess knowing you can stand firm at the back, then you have controlled the game. If you can attack at will and can engineer quality scoring chances that convert to goals at a decent ratio, then you can say you controlled the game. But to come away from a game where you had a major portion of possession with no goals to show for it means that, even at the slightest fraction, your tactics didn’t work. Tactics are indelibly entwined with the outcome they seek to achieve. Inter sought to score at least one, and concede the least amount possible. Fiorentina had to score, not just one, but 3 goals to win. That they didn’t even score one means that their tactics failed, regardless of how much of the ball they had. That’s not a facetious comment, but from bitter experience, being the “better looking” team, or the team with the most possession, doesn’t keep you in a coaching job when the outcome is more losses than wins. Spot on, but I’d disagree that losing a game ALWAYS means you were tactically inferior. For instance your gameplan may be to contain the opposition and hit them on the counter, if you do exactly that but your strikers fail to convert their opportunities (as was the case with Real in the first half against Barca at the weekend), then it’s the fault of individual errors rather than the system. This is ridiculous. Tactics is about maximizing your resources/players. A team can be tactically spot on and lose, and they can be a disjointed mess and win. That’s definitely Mourinho preparing for Barca more than worrying about Fiorentina’s attacking threat. Knowing that he plays the 2nd leg away where a single goal can give him the win, I think he’s gonna approach the game ultra defensively, aim to keep a clean sheet in Milan no matter what, and hang on to the draw in Camp Nou till a lucky counterattack or penalties if need be. Can’t say I blame him, given what he’s up against. So what formation do you see him using in the home game Pinturicchio? ZM’s article already showcased the preference towards a free holding midfielder at all times to break the opponent’s passing. Lone striker should also be a given, most likely Milito. Extra pressure on Barca’s right wing to keep Dani occupied by using Eto’o as a defensive winger is quite likely as well. I wouldn’t go as far as to say he’ll start with a sweeper from the first leg, but it’s a strong possibility for the 2nd leg or even the 2nd half at Milan if the pressure is too high. All in all, a very tight, defensive 4-5-1 with a possibility of switching to 5-4-1 down the road seems the most likely route. Inter’s formation against Barca could be a return to the midfield diamond with Eto’o playing as a defensive left winger (like Ji Sung Park) when Barca have possession. The key player in that matchup is the left carillero who will probably be marking Xavi for most of the match. Stankovic is probably the best bet, as (on his good days) he has the legs to do a lot of running and the attacking acumen to retain possession. Muntari gives the ball away as quickly as he wins it and his rash challenges would get him sent off. Motta is just too slow to chase the ball against Barcelona. Can’t see Mourinho using diamond in this one. I’d predict sth similar to 4-3-3/4-5-1 (whatever you wanna call it) that Mourinho used after 2nd goal vs Chelsea. Edit: Sorry, I’ve misread your post. Etoo as a “defensive winger” would be interesting. The problem with 4-3-3/4-5-1 for me is that Pandev is out of form and Balotelli refuses to track back effectively. He left Chivu by himself on a number of occasions last night (the cameras showed Chivu screaming at him) and it nearly cost Inter the tie. Pandev simply hasn’t been very good recently and is more dedicated to defensive work than Balotelli but he isn’t particularly effective at it. Ok but the question is how to contain Alves (and Maxwell) if u play the “midfield diamond”. Well Alves is taken care of by Eto’o as the defensive winger. I think Sneijder and Milito would be the ones pressuring Maxwell and Toure, knowing that one of them will likely be afforded some time and space. Actually that’s an important reason why Mourinho doesn’t seem to like Balotelli. He just doesn’t work half as hard as Olic does. I believe it is ‘too few’ not ‘two few’? I feel that Frey could have done more for the Eto’o goal, but he had done so much already, cannot ask for more. Fiorentina’s season is illustrative of the limits of a manager’s ability to apply tactics when his squad is understrength. I have always much admired Prandelli’s man management and general positive tactical approach. He simply has not been given the squad with which to compete effectively on 3 fronts. Fiorentina’s lack of depth leaves little options. Especially glaring is the use of Felipe- a centerback of some promise, as a wing fullback. Against a squad as powerful as Inter make shift will not due. One could argue that Vargas shouldve been pushed back, but when the team needs to score multiple times it would not have made much sense to push back what is arguably your most incisive offensive threat. To be honest I think this is the only way Mourinho can stop Barcelona in their current form-5-4-1. As said in a previous article on this website, the main threat of this Barcelona ‘Alternate’ formation is to drag the centre midfielders out of position and create space for Messi in between the lines, to play 4 screening midfielders they will suffocate the space between Defence and Midfield. Also with a ’spare’ CB like Lucio, he can read the game far better if he has no one in his immediate vicinity and quickly be the first to through balls or at least run the player who has recieved the ball into alleys that will allow Inter to regroup. Some may say this is too Defensive but as with all great attacking teams (eg Barcelona, right this minute) their motto is- You score 1, we score 2, you score 2, we score 3. The 1970 Brazil team is a prime example of this. So IMO i think this is the way to nick a win for Mourinho’s efficient team and thats what it’ll be-’Smash and Grab’ football. An important thing to stop Barça is to make use of the space they left behind of their full backs. You simply cannot defend that many attacking players in your half, a too defense-minded tactic wouldn’t work, as many team had proved. in response to mcgie76, your argument is stupid. i’ve never posted on this site, but i got as frustrated as the other posters when reading your arguments, and i just had to throw in my two cents. tactics can give you a probabilistic edge against a team. in essence, its all about maximizing the probability of gaining a favorable result. do you watch football regularly? have you never seen a team win, yet get outplayed? furthermore, there is no set of tactics which will ensure victory for a relegation battler against a title contender. this is what your argument implies, and i am simply boggled by that thinking. Without getting into it, if you read the rest of the thread, my replies are in response to the idea that a team can lose but be “tactically better”, which in all my years of coaching, I’ve never found to be the case. Tactically good, yes. But tactically better whilst losing, all things being equal? No. Opponent scores 40 yard screamer. You sky 5 sitters. Your tactics were superior, and you lost. Simple really. Yes, you’re absolutely correct, individual performances, good or bad, are a major factor. However, from the coaches point of view, if individuals are missing their target or otherwise underperforming, then the tactics have to change to take this into account. For example, Gerrard at Liverpool is not a good corner taker, yet he takes a lot of Liverpool corners and wastes possession – some of these corners, under a different taker, might have yielded goals, yet Liverpool persist with Gerrard being the main corner taker. This is a tactical failing, regardless of the individual involved. So tactics aren’t set in concrete, but they necessarily reflect the objectives of the team using them. 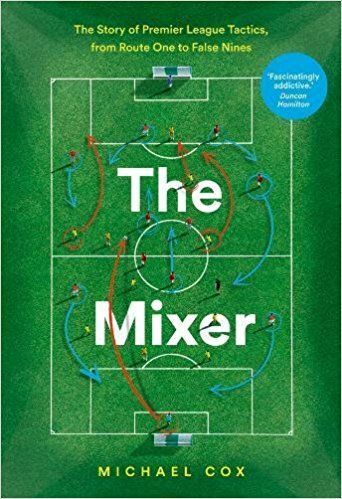 With that said, my point is that when a team loses, in most circumstances, it cannot be said that they could be tactically “better” than the winners, because either the losers failed in one area of tactics, or the winners succeeded in one area, or a combination of both occurred. In what way is it ridiculous? If you maximise your resources better than the other team, then you shouldn’t lose. If you lose, how can you be tactically spot on? Only if your starting resources are equal. Which is never the case. You maximized your resources, but it was an off day/your team simply isn’t as good as theirs/the ref made a mistake/etc. That’s not right. Tactic is an order, a system, it needs to be put into practice by players. Football is played by players. First, let’s have an extreme example. When you have Accorington against, say, Barcelona. How do you make sure you wouldn’t lose by ‘maximise your resources better than the other team’? 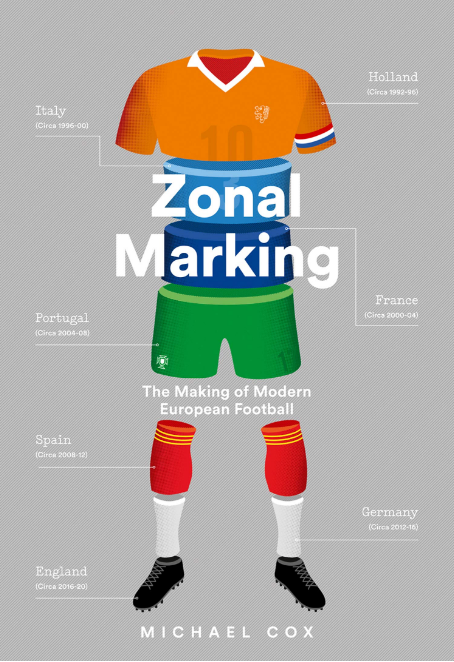 Second, there is generally no 100% sure thing in football. Therefore there is no ’shouldn’t lose’. You said it yourself when you used the word ’should’. Should doesn’t mean always. The best a tactic can do is create goal scoring chances and reduce the opposition’s goal scoring chances. But their called chances for a reason, it’s only a chance to score, no goal is ever assured. Tactics in this game are important but assuming that the winning team always wins because their tactics were better is just foolish. Not to read to deep but sounds like you fear uncertainty and must find a reason behind everything. Mourinho didn’t win that game due to tactics (Even the best teams need luck sometimes), he won it because Eto’s chance resulted in a goal and Fiorentina’s chances didn’t. And there’s nothing wrong with that, but there is something wrong with saying Inter’s tactics were better than Fiorentina’s just because they won. Well you could argue then that teams like Barca, United, Madrid, the two Milans etc., should never lose against the likes of Fulham, Stoke, Albacete, Chievo, etc. But they do. With a team like Fulham who consistently get results against big teams, you can’t say that every team they’ve beaten has had an off day or benefited from ref’s mistakes. They simply outplayed the other team by astute use of tactics, and the opposition didn’t have the tactics to change the course of the game. Ref excuses, off days, etc. are just excuses when teams have been tactically outmanouevred. I wish every chairman and DOC held your view, because then I’d never be out of a job Sadly, the reality of the game (and of all tactics, from sports to the military) is that if your outcome is negative, then your tactics didn’t work. If your outcome is positive, then your tactics worked better than the opposition (even if that means theirs failed concurrent to yours working). I never said big teams can’t lose to smaller teams because they are outmanouevered, I said that not every loss is down to tactics. This is so obvious I don’t know why I’m bothering to repeat it. You seem to have a definition of tactics so broad it is rendered meaningless. The alternative is that you think the quality of players is irrelevant, which is too insane to be true. So in reply, then, player for player, resource for resource, are Fulham a better team than Juventus? Are they better than Wolfsburg? Can’t catch you to be honest. Do you mean that Fulham has weaker players and they won teams with better players therefore their tactic decides it? If so, here is my opinion. First, checking the league position of Fulham, Juventus, and Wolfsburg, I can’t say they are too far away from each other, player to player. So, a suitable tactic surely helps. Second, Fulham indeed did brilliant work on their tactics to control the back 40 m region of the pitch in Europa league. They did probably ‘maximised’ their resources, however, that didn’t necessarily mean they won’t be defeated and they did lost for many times. For example, a 3-1 defeat in Turin. Anyways, you can still insists that all these comes from right tactic. They got their league position because of tactics. When they win, they have right tactic, and when they lose they have wrong tactic. That just …. makes little sense. I am not saying tactics does nothing, tactics just doesn’t decide everything. That’s all. Alves plays too far forward to be taken care of by Eto’o who will still need to play close to the Barça goal.